A road accident which claimed the life of a “hard-working” and “well-liked” motorcyclist was all down to a momentary lapse of judgment. That was the finding of a coroner yesterday, as the details of the crash which killed Noel Campbell were laid out before an inquest. Mr Campbell, a 46-year-old creamery worker from Old Newry Road, just outside Rathfriland, had been on his black Honda when it collided with the back of a silage trailer towed by a tractor. 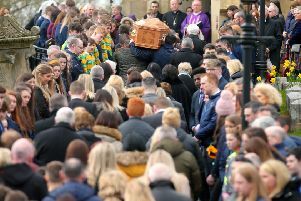 It happened on the rural Rathfriland Road, about two-and-a-half miles from Newry, at about 4.20pm on June 15 last year. He died in Daisy Hill Hospital that evening. Warm tribute was paid to him during the hearing, which was told his injuries were so severe that no medical intervention could have saved him. Road conditions were good that day, the court was told, and neither vehicle had any problem which would have caused the crash. Dr Peter Ingram, assistant state pathologist, found he had repeatedly fractured his pelvis, left clavicle, 10 ribs, and was bleeding into his lungs – among other injuries. There was no alcohol and only normal levels of prescription medication in his blood. No estimate of vehicle speed was given to the court. Marie Downey, who knew Mr Campbell, came across the crash soon after it happened. She said he was “a grey colour” but able to speak, adding that his helmet had come off and was lying by the bike. Crash investigator Damien Coll said “there is nothing to say exactly why” the collision happened. He suggested that either Mr Campbell may have attempted some kind of overtaking manoeuvre, or that he sought to deliberately crash. GP Dr Siobhan Wade said Mr Campbellhad suffered from depression in the past and had been given medication which is prescribed to sufferers of psychosis. He also had a twitching condition called dystonia, for which he was being treated. Mr Campbell’s sister Cora McCartney described him as a quiet man who enjoyed music. Delivering his findings, the coroner, Joseph McCrisken , found the extent of his injuries had been “unsurvivable”. He noted that Mr Campbell – a single man with no children – had experienced medical issues, but ruled out the idea of an intentional crash. “In my view, that simply did not happen,” he told the court. The coroner ruled Mr Campbell “did not intend to impact with the back of the trailer, and that – for some unknown reason, I think is the only thing we can say – he misjudged the overtaking manoeuvre”. “No-one will know what happened really that day,” he said.